The driver of a semitrailer plowed into morning traffic slowed for a bridge construction project Thursday along the Indiana Toll Road, killing at least eight people and injuring two others, police said. The eight confirmed victims included five who died in a single vehicle, said 1st Sgt. Dave Bursten of the Indiana State Police. Four of the victims were Amish residents northern Indiana who were passengers in a car. While the Amish typically do not drive motor vehicles, it is common practice here for Amish workers to hire a driver to take them to work. LaGrange County has one of the largest Amish populations in the country. The 6:45 a.m. crash about 25 miles east of South Bend occurred when the driver of a semitrailer rear-ended another vehicle and started a chain reaction crash involving two other semitrailers and four cars that had slowed near a construction area, said state police Sgt. Trent Smith. He said it was unclear why the semi driver didn't brake as he approached the area. "At this point we don't know the reason. He did not slow down," Smith said, adding, "It's one of the worst accidents that we've had up here." Smith said five of the victims died in a van but that the van's driver survived the crash. 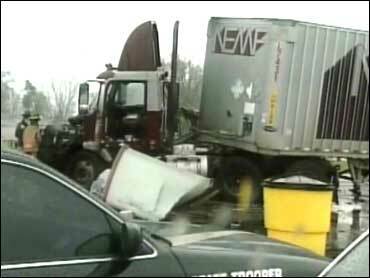 CBS affiliate WSBT correspondent Ed Ernstes witnessed a van totally lodged and compressed under one of the semis. Smith said two of the fatalities were people riding in a sport utility vehicle, and the eighth victim was the driver of a pickup truck. The accident occurred in the tollway's westbound lanes about 1½ miles before the start of a construction site where highway workers are rebuilding a bridge. Traffic had come to a standstill in the right lane and was moving slowly into the left lane. Warning signs were posted along the highway up to three miles from where the construction site began. "There are thousands of people that travel these roads every day. All it takes is one person not paying attention for a split-second to cause these accidents," Smith said. Hours after the crash, hazardous materials workers were working to clean up diesel fuel that stood in puddles or was streaming along the roadway from the damaged semitrailers. Investigators were collecting evidence and working to identify the victims. Thursday's crash left westbound lanes closed about 40 miles west of the Ohio state line. 1st Sgt. David Boehler of the state police said it was raining at the time of the crash, but investigators did not believe weather played a role in the collision. At the crash scene, a crew hauled away a vehicle that was so heavily damaged it was unrecognizable. One of the semitrailers appeared to have a crushed front end and fire damage. A pickup truck that was facing the wrong way had its back end torn off in the crash. This accident brings the number of deaths on the Toll Road to 20 since 2005, according to WSBT. Four people were killed and seven were injured on Aug. 22, 2005, when a semi rear-ended a car that was slowing for the construction zone. On May 10, 2006, a woman and her two children were killed when another semi rear-ended an SUV. Five people— four from one family — died last Aug. 2 in a fiery crash involving a semi. All of these accidents happened near Bristol.